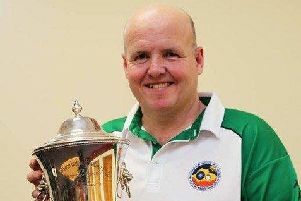 Paul O’Donnell skipped Bainfield to title glory in the Scottish Triples Championships of 2008/9 and 2009/10 and he is back in the thick of this weekend’s action. The current manager of Bainfield’s Premier League team continues to have Craig Paterson for company in his triple, but the migration of Craig Moss to West Lothian forces one change of face with the introduction of Danny Gormley. Cumbernauld is the destination for today’s play, and Bainfield face Auchinleck in the prelim session at 9.30am. The eye-catching clash on the early session is between rivals Midlothian and East Lothian. Scott Kennedy, Andy Jeffrey and Billy Mellors captured the national crown for East Lothian in 2007 and were due to be back as a trio this weekend. However, Jeffrey can’t make it and is replaced by 2017 winning skip Derek Oliver. He takes on his fellow double Commonwealth Games gold medal-winning colleague Ronnie Duncan, who lines up at lead to Billy Peacock and Colin Walker in the Midlothian triple. West Lothian have a first-round clash against Glasgow on the 2pm session at Abbyveiw, Dunfermline. Craig Moss and plays in the middle of Stuart Johnston and Mark Allison against David Elliot (skip) of Glasgow. The Balbardie trio of Walter McDougall, Mark Bonar and Sandy McDougall have a bye into the first round. • THE ladies are also in Triples play-down action this weekend and the Bainfield challengers are Chloe Thomson, Mandy Jenkin and Anna Anderson. They open in the first round (2pm) against Auchinleck at Cumbernauld. East Lothian and Midlothian make the same journey with sisters Kim and Dee Hoggan joined by Melissa Penman at lead in the EL trio that faces Cowal in the prelim round. Shona Johnstone skips Sandra Muir and Margaret Porter for Midlothian against Dumbarton, while at Abbeyview it is Jenifer Richardson, Anne Muirhead and Liz Boyle for WL and Kim Ross, Betty Johnston and Pat Purdie for Balbardie. 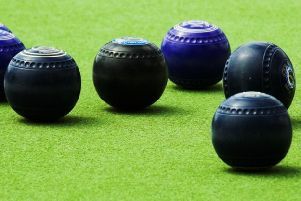 • Dee Hoggan and Emma Logan of East Lothian, Lorraine Craig of Balbardie and Stacey McDougall of Midlothian have been named in the line-up for the ladies Home International Series at Falcon IBC in Essex over the weekend of March 9. Wendy Purdie of West Lothian is a recall on the reserve bench, having last played for Scotland in 2014. • A top-of-the-table clash in this week’s East B section of the Seniors League saw East Lothian win 64-55 at home to Midlothian, while Balbardie suffered a 69-64 defeat at Teviotdale. • Midlothian sit three points clear at the top of the gents B section of the Premier League following an 84-69 win over Turriff at Dalkeith. Colin Walker skipped his rink to a 26-12 victory, supported by a 22-15 win from Ronnie Duncan and a 26-20 success for David Peacock. Billy Peacock’s rink lost 22-10. East Lothian won 98-51 at home to Abbeyview with Joe Mower orchestrating the team effort with a 27-11 victory, supported by a 25-9 win from Billy Mellors. Alex Marshall had a 20-18 win. Bainfield were unable to live with champions Blantyre and lost 98-56 away, but remain out of the bottom two. West Lothian scored a welcome 93-75 away win over joint leaders West of Scotland in the A section, while Balbardie lost 81-74 at Headwell in Division 1 North. • East Lothian ladies stormed to a 68-44 away win over Abbeyview in the Premier League East B, while West Lothian were crushed 72-36 at home to East Fife. In Division 1 East, Bainfield remain top with a 65-58 win at home to Tweedbank, while Balbardie lost 73-43 at home to Headwell.